Last month, the long-awaited inclusion of Super Sonic had finally come to pass for Sonic Forces, but there was a nasty catch: the Chaos Emerald-powered hedgehog would have only remained free for a limited time. A series staple since Sonic the Hedgehog 2 over twenty-five years ago right up to the recent Sonic Mania, either earning the seven Chaos Emeralds or clearing the game’s story often yielded the highly coveted reward of Super transformation. From there, simply collect fifty rings mid-stage, transform, and blast off with ring-fueled invincibility and faster speeds. While oddly absent from the game’s initial release over a month ago, Sonic Forces is finally bringing in this long loved franchise staple at long last as free downloadable content… unfortunately, with a catch that is already drawing community backlash. 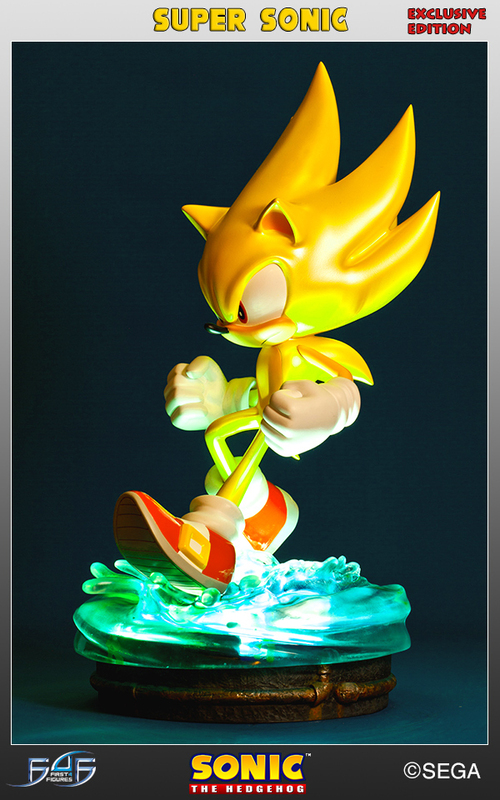 Modern Super Sonic; First 4 Figures’ latest offering has opened for pre-orders today, with a whole slew of extra details about the statue following in its wake. The statue, which was revealed to fans some months ago at Weston Super Sonic depicts the climactic moments from the final battle in Sonic Adventure with Perfect Chaos, with Super Sonic splashing down into the flood waters that swamped Station Square. And a slightly less flashy and less limited (1500 pieces) regular version for $224.99. Both versions of the statue are due to arrive in Q1 of 2016. I think it’s safe to say in this instance that the Exclusive version is where it’s at this time around. I mean… Look at some of these darkened shots, and how the light shines up from the base to light up the entire figure. Hooray for clear resin! With Modern Super out of the way, it begs the question of who or what will be next for the Modern line? Time will tell for sure. We knew it was coming, and now it’s just around the corner. 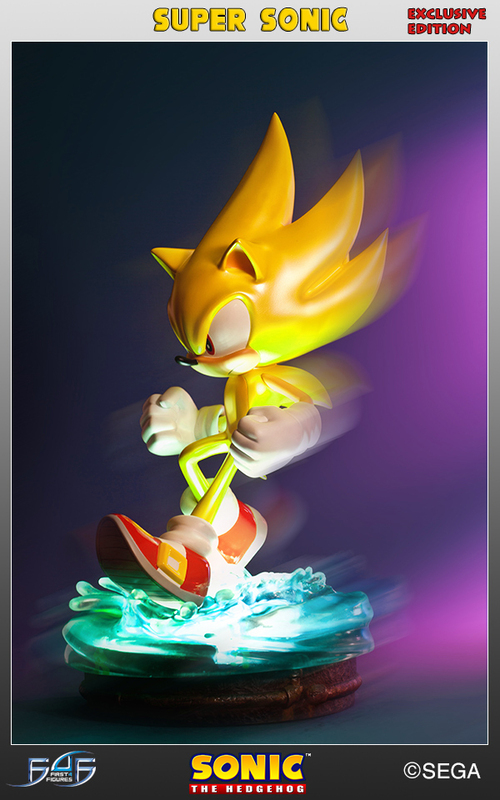 First 4 Figures’ Modern Super Sonic statue will be going up for pre-orders this coming Tuesday (5th May 2015). Originally revealed at Weston Super Sonic earlier this year, the statue portrays Modern Super Sonic splashing down into Station Square’s flooded remains in a pose reminiscent to this piece of artwork. The statue also includes a kick arse lighting effect that causes the water on the top of the base to light up. Below is a video our very own Hogfather got of the statue during his visit to Weston Super Sonic of the statue, and its lighting features. Be sure to join us on Tuesday, where the full official reveal of the statue will take place! SEGAOnline.nl has posted up exclusive gameplay footage they’ve recorded from the final build of Sonic the Hedgehog 4: Episode 1‘s PS3 version. In the video we see footage of the console exclusive redesign of Casino Street Zone Act 2, which was shown recently on CNET’s preGame, but now we can see and hear it played directly and in high quality. Super Sonic is shown in full force throughout the stage and it sounds like the music for this Act, as well as Super Sonic’s theme music have been completely revamped. Do you like the new Casino Street Zone Act 2 and the musical changes? Share your thoughts in the comments. Thanks to Shaddix and Indigo Rush at the SSMB for the heads-up! 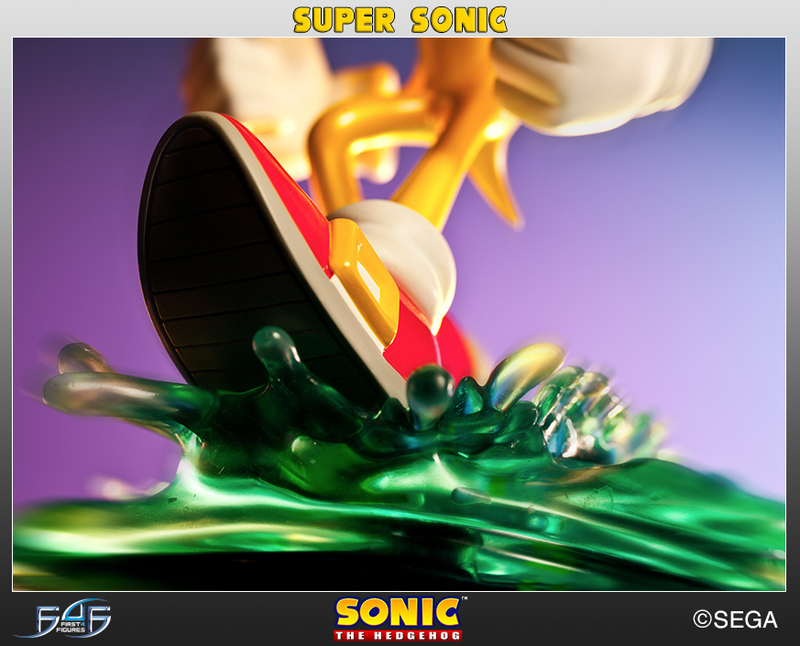 You may have seen our article posted 18th June regarding First 4 Figures announcement of a Classic Super Sonic figure in the works with a small teaser picture, well today First 4 Figures have fully unveiled the project which has turned out to be a statue of which is second in a series after the last one they created of Classic Sonic standing on a Green Hill Zone esque platform. 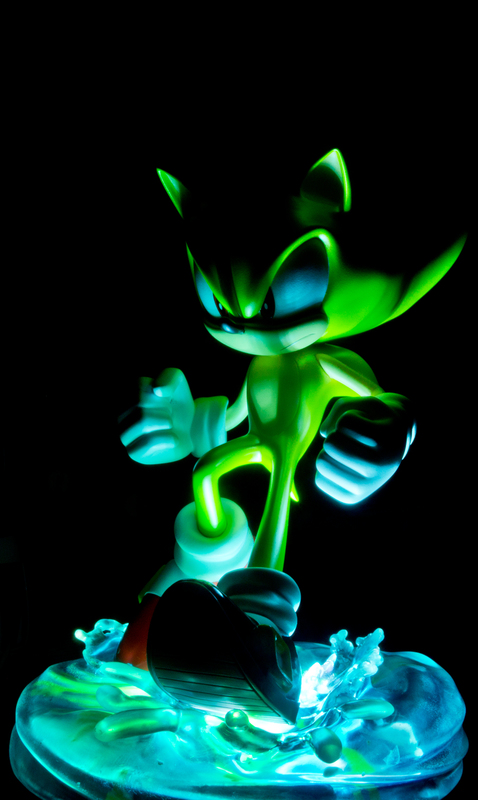 This Super Sonic statue also has a second version which brings something completely new to the table(or wherever you decide to place it *bad joke*) with it’s ability to light up the energy shockwaves the powered up hedgehog is giving off on the Chemical Plant Zone themed platform. You can pre-order the statues starting today over at First 4 Figures website where you can also find more pictures from different angles of the statues. Thanks to Frozen Nitrogen at the SSMB for the heads up! Want a Chaos Emerald fuelled super powered hedgehog in your merchandise collection? 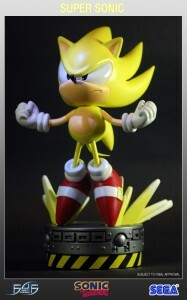 Well want no more as First 4 Figures have lifted the lid on the latest figure, Super Sonic! When can you get it and for how much? That information hasn’t been revealed yet but as seen in the above ad originally posted on their Facebook page, you can pre-order from June 22nd to make sure you get your figure. Get Excited: New Sonic the Hedgehog Mini Figures On The Way! 1.5″ Mini figure MECHA SONIC!!!!! Now hopefully they haven’t gone and got their robots mixed up (because usually this is what happens) – becuase if they haven’t, there may very well be a chance of owning a tiny version of the robot you fight at the end of Sonic & Knuckles, to many the coolest incarnation of Sonic’s robot counterpart! Either way, fans will at least be getting another Metal Sonic figure…something you can never have too much of! Until then, I guess we’ll have to make do…apparently Amy and Super Sonic were on display at the Neurnberg toy fair, with punters being forbidden to take photos, but hopefully some will surface soon! Expect these figures to hit UK shelves around the 30th of July, 2010. Exciting stuff! A costume design company in Shangai, China who sell many of their costumes on eBay ranging from Beijing 2008 mascots to weird advertising things like OMO(whatever that is) are selling a New condition Super Sonic costume that actually looks very well made, especially compared to the other crap Sonic costumes on eBay. The costume has the light orangey colour we saw from Sonic 2006’s Super Sonic, the spikes curving up, the red eyes and the more serious mouth so they’ve done their research. At the moment there are no bids which start at $0.99(approximately £0.62) with the end date being 17 Jul. Postage is worldwide but make sure you have a spare $84.00 to cover it on you. So the US version of Sonic Unleashed is already out, apparently (for the Wii and PS2 it seems). Those lucky gits who decided to take it slow and start with the manual noticed an advertisement for the Werehog figure we spoke about a while ago. But wait, what’s this other circle about? 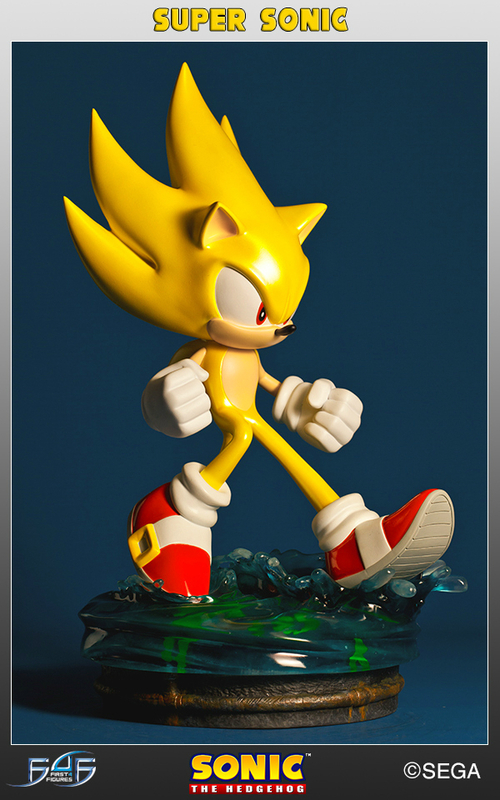 Yes, looks like Super Sonic is also available as a collectible figure, thus increasing my British envy. The toys will supposedly be available this month, it’s worth checking out Sega America’s official website for more details on where you can grab ’em.